There are endless options when it comes to finding the perfect Toronto gift baskets. I only recently bought a gift basket for a friend as she’d had a really rough time of it recently as her bathroom was in a crisis! Luckily, a Toronto emergency plumber was at hand to help her. If it’s your first time ordering a Toronto gift basket, you may be visualizing a classic corporate gift basket. A plush wicker basket filled with gourmet treats and decorated in a fancy bow come to mind? I hear a Custom Bobbleheads go fantastically with any of the gifts below. Today, Toronto’s gifting industry offers curated gift ideas packaged in everything from wicker baskets to luxe boxes, antique farmers pales to wooden wine crates. Our favourite Toronto gift baskets are made by local brands that specialize in a unique niche. If beautiful blooms are your thing, be sure to check out our guide to Toronto Flower Delivery. Many florists in Toronto offer the option to deliver fresh flowers with luxurious gift baskets. Wine Gift Baskets: Charlie’s Burgers Wine Program pairs hard-to-find bottles with treats from Toronto’s own Cheese Boutique. Ravine Vineyard in Niagara offers made-to-order gift basket ideas featuring their award winning wine and gourmet Lowery line. If you’re in a celebratory mood, you’ll also find plenty of Champagne gift baskets online. Gift Baskets for Men: Bright Baskets specializes in custom gift baskets for men, which can be built around any gents interests. You’ll also find beer gift baskets offered year round, and thoughtful Father’s Day gift baskets in June. Holiday Gift Baskets: December is the busiest time of year for corporate gift basket delivery in Toronto. While Christmas gift baskets are the most popular you’ll also find gifting ideas for Valentine’s Day, Chinese New Year, Hanukkah, Diwali and Purim. Baby Gift Baskets: thoughtful gift basket ideas for babies and newly minted moms offer a simple solution for your next baby shower. Foodie Gift Baskets: our favourite gift basket ideas are filled with gourmet treats you can eat! Foodie gift baskets offer the most diverse options. You can find Toronto gift baskets specializing in fresh fruit, coffee, tea, cheese, healthy snacks, popcorn, chocolate, cookies and more! Mother’s Day Gift Baskets: perfect for the men out there who find shopping a challenge. Ordering specially designed gift baskets for women takes all the time and stress out gift giving. Spa Gift Baskets: we love Bathorium’s Ontario-made gift sets for bath lovers. Many Toronto gift basket brands offer a selection of spa inspired products like bath bombs, salt soaks, scrubs and creams. 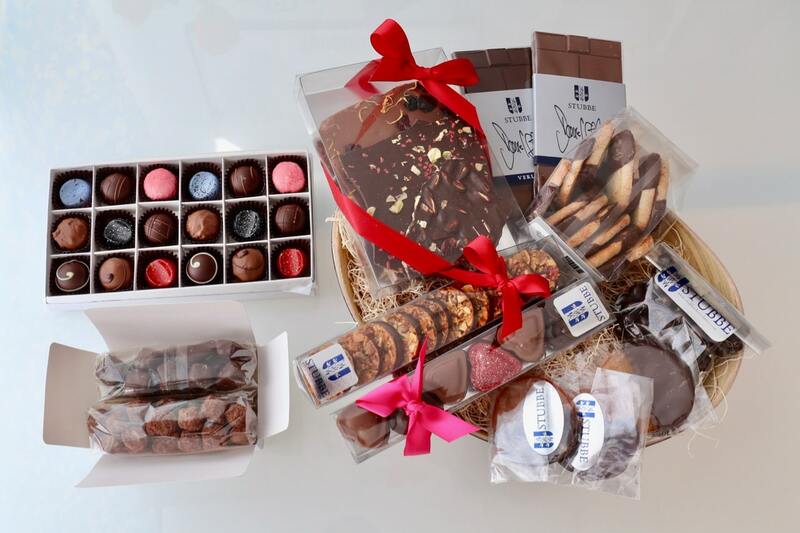 We scoured the internet to find the best gift basket delivery services in Toronto. 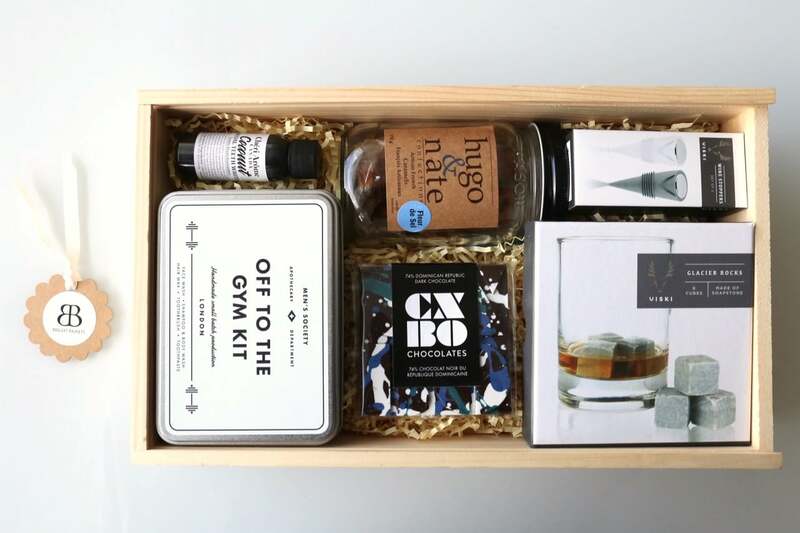 We’ve sampled the city’s best gift basket delivery services and featured our favourites. From traditional corporate gift baskets, to unique brands that cater to a specific niche. Bathorium offers spa treats for Toronto gift basket lovers. Greg Macdonald and Mathieu Roy Chabot dreamed up the beauty brand Bathorium while working as cocktail experts at the luxurious Shangri-La Hotel Toronto. It was in 2014 when the duo found inspiration in how Europeans treasure their bath time. Soon after they decided to launch their own company to help Canadians find beauty in the bath. All of Bathorium’s bath products are made in Canada at the company’s Kanata, Ontario headquarters. They source ingredients from all over the world to ensure the best quality of natural oils, salts, clays and butters are used to detoxify and moisturize the skin. Bathorium’s online shop features a wide selection of gift ideas for spa and bath lovers in Toronto. The Canadian beauty brands signature product is a line of luxurious Bath Bombs. You’ll also find Bubble Bath Elixirs, CRUSH bath soaks, and a selection of seasonally inspired gift sets. 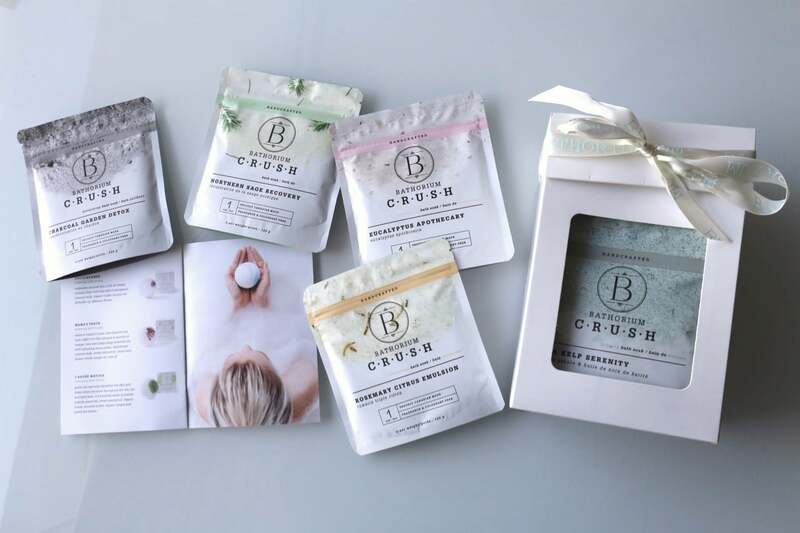 Bathorium’s gift sets are ideal if you’re looking to order a gift basket in Toronto for someone who loves to unwind in the bath. They arrive in a white gift box wrapped in a satin ribbon. Bathorium’s speciality spa gift baskets are shipped within 1-2 days. Shipping in Canada and the US is free for orders over $59. Toronto’s Bright Baskets specializes in gift baskets for men. Genina Brigden owns Bright Baskets, a luxury gift basket company in Toronto that specializes in bespoke gifting. In 2017 she launched the Bright Baskets brand. Brigden spent the majority of that year sourcing products and fulfilling custom orders for her clients. Brigden tries to use as many Canadian products in her gift baskets as she can. She attends the Toronto Gift Show twice a year to see what new local products are trending. Bright Baskets’ unique edge is Brigden’s ability to craft a truly customizable gift. She recently sold a gift basket to an outdoorsy couple who enjoy a good drink and playtime with their Bullmastiff. Their gift basket included a framed portrait of the dog, bottle of whisky, cocktail kit, vintage outdoor lamp and a canoe stamped wooden crate. Proof that Bright Baskets does an excellent job at crafting thoughtful gift baskets for men. Bright Baskets offers Toronto Gift Basket delivery as well the option for worldwide shipping. The overnight shipping rate across Canada is $15. Toronto Gift Baskets: Carnivore Club is the perfect gift for meat lovers. Owners Tim Ray and Matthew Cloutier launched Carnivore Club in 2013. The duo wanted to start a business that allowed foodies to discover top quality charcuterie every month from different small producers and importers. Carnivore Club is the only subscription service that curates premium charcuterie from a different supplier each month. The pretty red box is delivered straight to your door, or you have the option to gift Carnivore Club to your favourite meat lover. 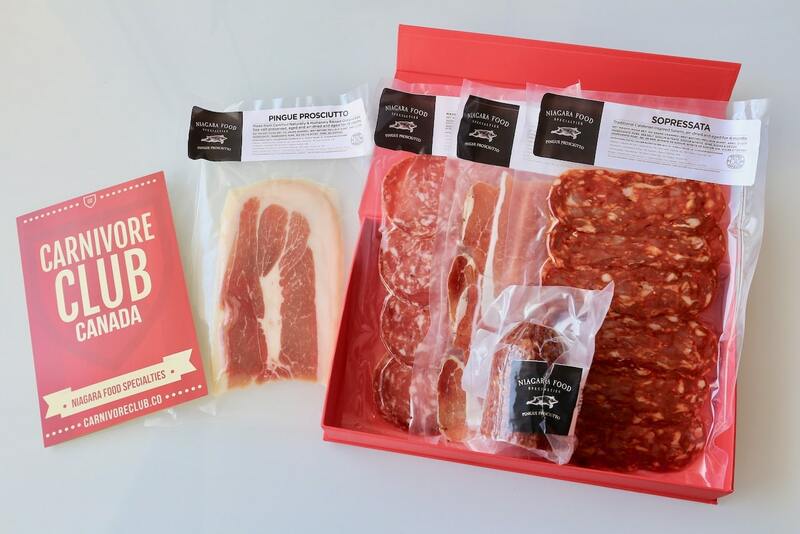 Carnivore Club’s Classic Box delivers 4-6 premium quality cured meats. Gift exclusive access to salamis, prosciuttos, bacon, and more from small producers the recipient won’t find at their local grocery store. Celebrating a special occasion? You can also upgrade The Classic Box to a keepsake wooden crate made with Wisconsin Pine for just $30. Carnivore Club ships across Canada, USA, UK and Australia. Delivery fee in Canada is $9.99. Franco Stalteri is the man behind Charlie’s Burgers. The brand initially launched as a series of secret private dining events, hosted by high-profile chefs in different locations. Charlie’s Burgers has collaborated with chefs recognized by The World’s 50 Best Restaurants, The Michelin Guide and Relais & Chateaux, in Canada, Italy, England, France and the US. In 2010, it was ranked by Food and Wine Magazine as #3 on its list of “100 Best New Food and Drink Experiences in the World”. The Charlie’s Burgers team tastes upwards of 700 wines annually and visit wine producers across the Old and New World. They select 12 producers each year to be featured in the CB Wine Program. Charlie’s Burgers selects and imports cases of wine (2-6 bottles per month) exclusively for its members. These special wines are not available for purchase anywhere in Ontario. 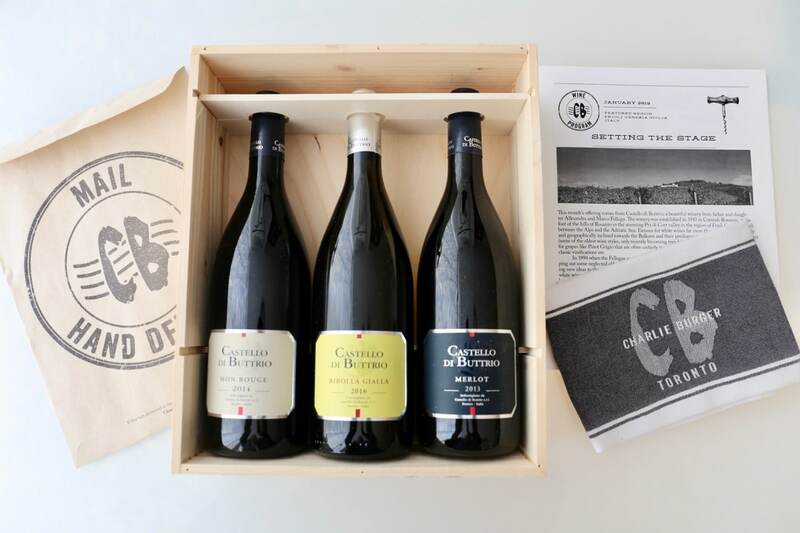 The CB Wine Program also features two different Toronto restaurants each month, allowing members to bring their wine to dinner and not pay a corkage fee. Toronto’s famous Cheese Boutique also creates a basket of products exclusively available to Charlie’s Burger members each month. Items are selected to pair perfectly with Charlie’s Burger wines and are available to members at wholesale pricing. It’s the perfect option if you’re looking for Toronto gift baskets that cater to discerning wine lovers. Charlie’s Burgers offers its wine program across Ontario. Outside of the GTA orders are subject to delivery fees of $15-30 depending on the address. Craig’s Cookies was founded in 2013, with a goal of celebrating the yum factor in chocolate chip cookies. Using only the best ingredients, owner Craig Pike and his baking team in Parkdale prepare some of Toronto’s most drool-worthy cookies. Craig’s recipe was passed down by his mother, who taught him how to bake in his native Newfoundland when he was a youngster. Craig’s Cookies are famous for being packed full of nostalgic decadence. Craig’s most popular offerings have Ferrer Rocher, Cadbury Mini Eggs, Mars Bars, Reese’s Pieces, Caramilk Mini’s and Strawberry Pop Tarts, baked right in to the batter. If you’re looking for a celebratory cookie gift basket, Craig’s Cookies offers small (4 cookies) and large tins (12 cookies) as well as plaid boxes sold with 6, 12, or 24 cookies packed inside. 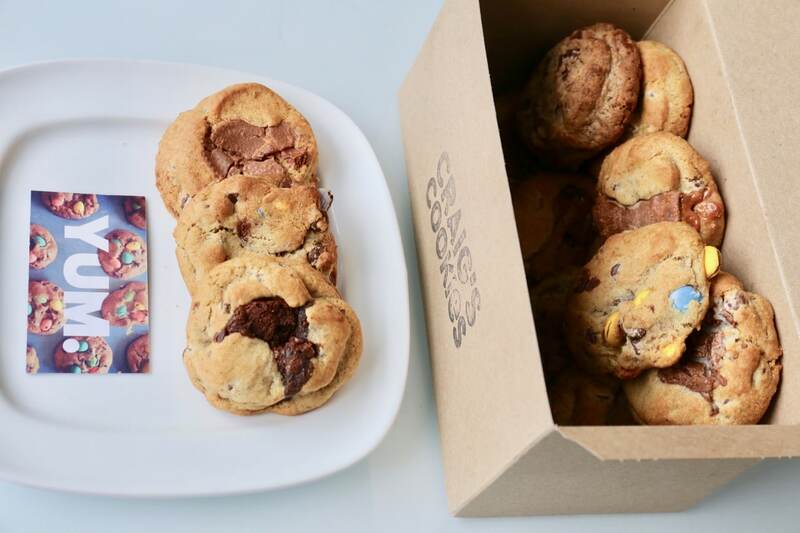 Craig’s Cookies delivery in Toronto is offered between Roncesvalles and Parliament, Front and Dupont. There is a $30 minimum order for cookie delivery and an $8 delivery charge for orders under $150. Orders must be made by 4pm the day before delivery. Desk Nibbles offers Toronto gift basket solutions for hungry office staff. Cassy and Emil Aite launched Desk Nibbles in 2016 after realizing how difficult it was for office managers to shop for all the items they need to keep employees happy and healthy. Instead of having to run to Costco or Walmart to procure office treats, Desk Nibbles makes it easier to order snacks, fresh fruit, and beverages straight to the office. While Desk Nibbles is predominantly a subscription service, anyone can order a one time snack box as a gift. It’s the perfect “outside of the basket” idea for brand managers or business owners. Why not treat members of your hardworking agency or offsite team to a celebratory snack? 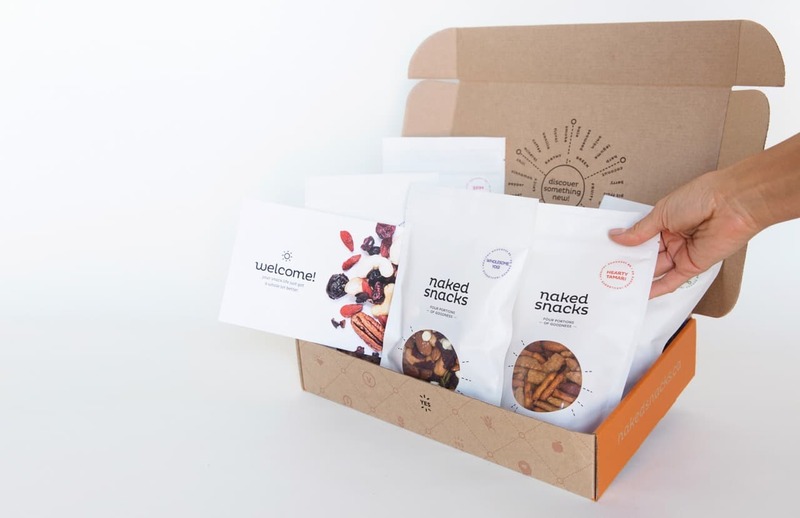 Desk Nibbles delivers its snack boxes for free across North America. Orders typically arrive one week after checkout. 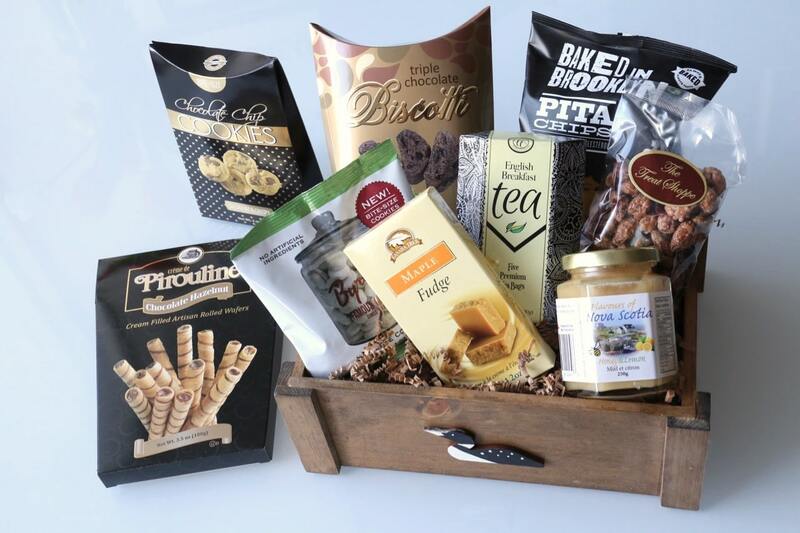 Toronto Gift Basket Price: The Nibbler Box ($119) contains 65+ snacks and is perfect for an office size of 1-14 employees. 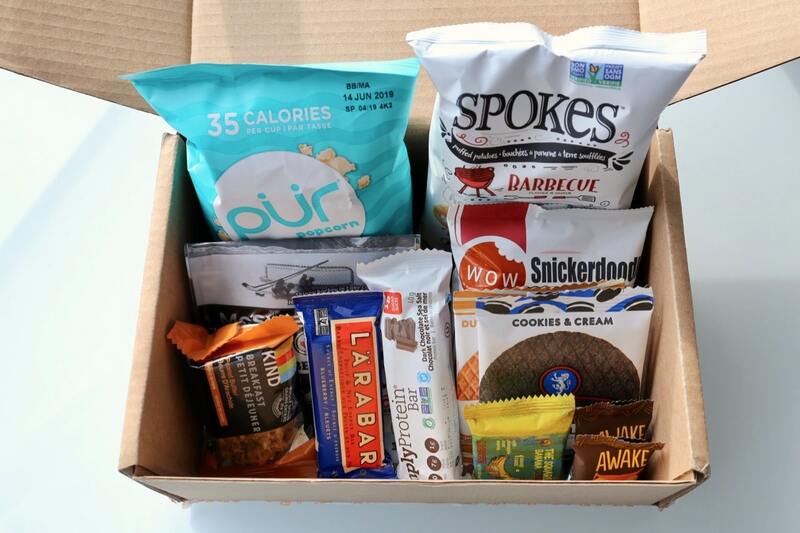 The Muncher Box ($209) contains 140+ snacks and is perfect for an office size of 15-29+ employees. A cottage inspired gift basket by Gifts For Every Reason. Alesse Antonik launched Gifts for Every Reason in her hometown of Whitby in 2003. It was during her grandmothers funeral that she looked around the room and said, “I wish someone would send something other than all these flowers. They were beautiful but way too many.” That year she started her Toronto gift baskets delivery service, an awesome alternative to sending flowers. Each Gifts For Every Reason container is assembled, sanded and stained by hand to ensure quality. The company does a great job at offering gift baskets for Toronto’s diverse communities. Popular seasonal gift baskets help celebrate Christmas, Easter, Hanukkah, Chinese New Year, Diwali, Ramadan, Eid and Purim. Gifts For Every Reason delivers across Canada in 1 -7 business days. Next day local hand delivery is offered within Toronto and as far as Hamilton, Keswick and Newtonville. Free delivery is offered across most of Canada. 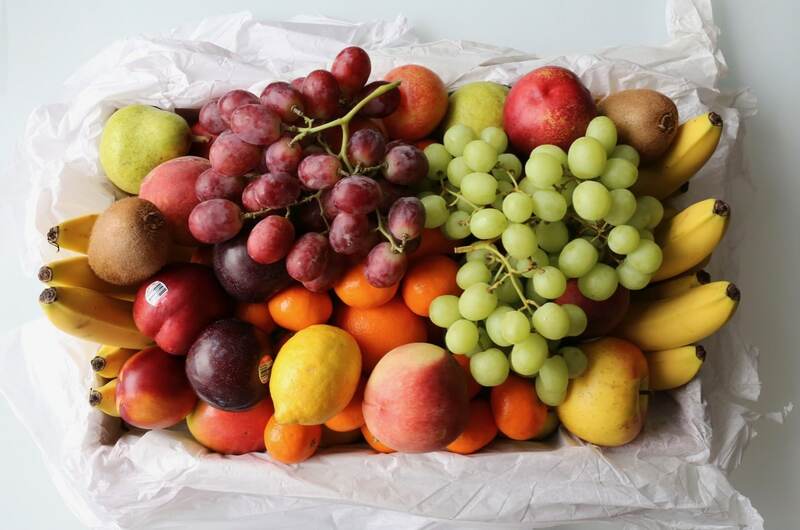 Harvest Planet specializes in healthy fruit gift baskets. Oakville residents Maria and Alexey Kondratyev launched their fresh fruit and vegetable gift basket business in 2017. Alexey has many years of experience in the fruit and vegetable business, managing the produce department in a supermarket. He has always been passionate about premium quality fruit as well as exotic fruits that are hard to find in regular Canadian grocery stores. Maria is a scientist who specializes in cancer research so is proud to invest her time in encouraging people to celebrate a healthy lifestyle. Harvest Planet delivers their fruit gift baskets across the GTA. A $9.99 charge applies for shipping on orders under $90. A luxurious corporate gift basket from My Baskets in Toronto. 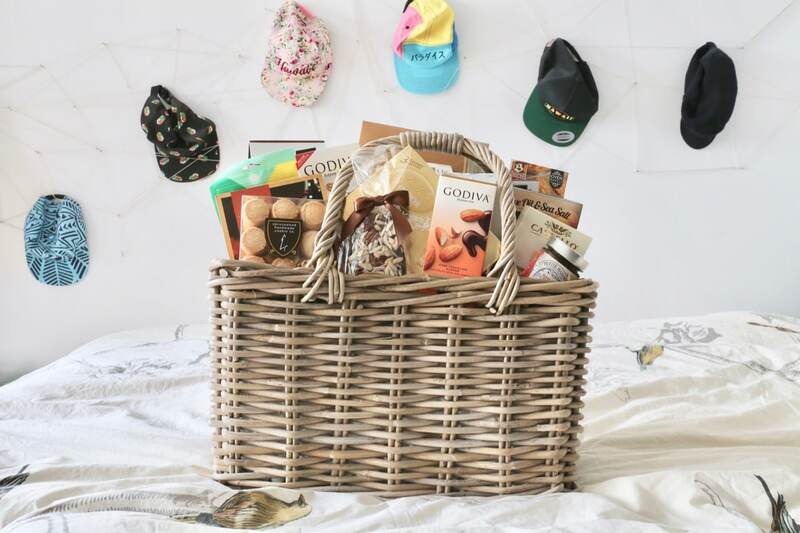 One of Toronto’s best online gift basket brands is My Baskets. Located in Concord Ontario, My Baskets offers endless options for those looking to purchase traditional corporate gift baskets. My Baskets was established 5 years ago. The corporate gift basket company services high-end clientele in Toronto. 90% of the company’s products are sourced from local Canadian manufacturers while 10% are premium products imported from Europe. My Baskets delivers across Canada. They charge a $15 shipping fee for orders under $100. Toronto gift baskets priced over $100 enjoy free shipping. Same day delivery in Toronto is also available, including VIP rush delivery in 2-4 hours. A French pastry inspired Toronto Gift Basket by Nadege. Chef Nadège Nourian is the owner of one of Toronto’s most celebrated French pastry shops. Alongside her husband Morgan McHugh, Nadege Patisserie offers freshly made French sweets at four Toronto locations: Queen West, Rosedale, The Path and Yorkdale. Nadege Patisserie is well known for its beautiful and delicious desserts. Pop inside and you’ll find a rainbow of French macarons, stunning cakes, miniature croissant sandwiches, tiny tarts and petit chocolate truffles. Nadege is perfect for those looking for a French-inspired gift basket in Toronto. You can fully customize your gift basket – spelling out a name or celebratory message on a chocolate tablet. 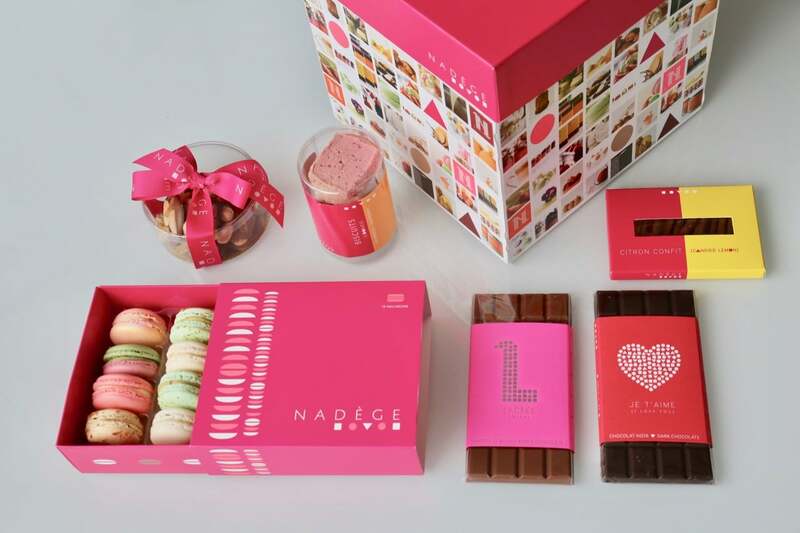 Nadege Toronto’s best selling gift basket is the Pretty in Pink Gift Box. The celebratory box includes macarons, raspberry biscuits, chocolate Mendiants, rangettes, and dark and milk chocolate. Nadege Patisserie gift basket orders need to be placed by 12pm for next day delivery. Nadege offers Toronto gift basket delivery to Pickering, Markham, Richmond Hill, Vaughan, Mississauga, Scarborough, Etobicoke and North York. The cost of delivery ranges from $25-60 depending on the address. Naked Snacks are the perfect Toronto Gift Baskets for healthy foodies. Husband and wife team Neil and Ryley Thomson launched Naked Snacks in Vancouver in December 2014. The idea started one Sunday afternoon after Ryley watched Neil sit on the couch and eat an entire bag of chips on his own. She looked at him and said, “Dude, that’s disgusting.” Neil’s excuse for being a human junk food disposal was that healthy food doesn’t taste good. Soon after that, they started creating snack flavours that were both healthy, delicious and a much better alternative to nutrient-free potato chips. Ordering Naked Snacks is also a breeze as it allows customers to design their own gift basket by choosing the snacks they wish to include. For people with dietary restrictions it’s important that customers can build nut free and gluten free boxes. The sender can also add their own personalized message that is printed onto a card and placed inside the snack box. Naked Snacks is proudly Canadian with all production taking place in the couples Vancouver kitchen. The snacks must meet nutritional specifications of 80% whole grown goodness and 20% earned indulgence. The most popular flavours at Naked Snacks are Hearty Tamari, Wholesome Yogi, Maple Praline Almonds, Wasabi-me and Sriracha Cashews. Naked Snacks ships anywhere that Canada Post delivers. They usually pack and ship orders that are received within 1-2 business days. Shipping is free to Toronto but delivery costs to other cities in Canada may vary based on Canada Post’s prices. Toronto Gift Basket Price: $32 for a 5 snack box to $56 for a 10 snack box. Ravine Vineyard’s gift basket filled with wine and preserves. Ravine Vineyard is an award winning organic winery, which sits on 34 acres of land in the sub-appellation of Niagara called St. David’s Bench. The five generations old family farm once specialized in canning Niagara’s famous stone fruit, but today is best recognized for its wine. Visit Ravine Vineyard during a Niagara wine tour and you’ll find a state of the art production facility, tasting room, local foodie market, bustling restaurant, and vines as far as the eye can see. Shop on Ravine Vineyard’s website and you’ll find a selection of gift baskets perfect for foodies in Toronto who love supporting local Ontario wine. 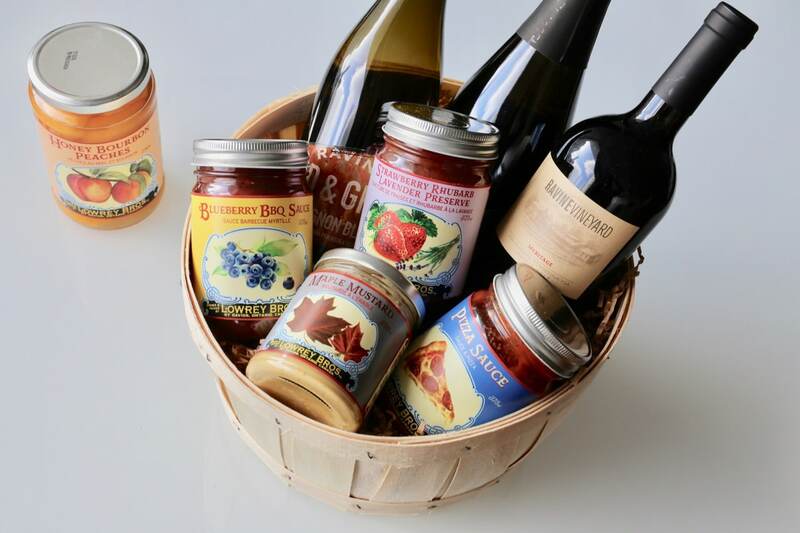 Ravine Vineyard’s gift baskets are customizable and can feature any of winery’s wines, as well as their line of Lowrey canning products. The gourmet Lowrey line includes delicious jars of Maple Mustard, Honey Bourbon Peaches, Pizza Sauce, Honey from the Ravine Vineyard hives, Strawberry/Rhubarb jam and BBQ sauce. Ravine Vineyard’s gift baskets are built to order and can be customized to your tastes. Get in touch with the team a few days before you need your Toronto gift basket delivered and they can fill you in on what seasonal items are in stock. Ravine Vineyard gift baskets ship throughout Ontario and are subject to a $15 delivery fee. Chef Daniel Stubbe is a sixth generation pastry chef and owner of Stubbe Chocolates, which opened in 1995 on Toronto’s Dupont Street. Chef Stubbe grew up in a small German town, where he spent his formative years playing in the kitchens of his family’s pastry shops. He attended culinary school and apprenticed throughout Germany. It was during this time that he honed his pastry and chocolate-making techniques and built upon the knowledge that had been passed down to him by his father. Chef Stubbe later immigrated to Canada, joining his father in Ottawa to open a shop in Byward Market. Today, Chef Stubbe can be found leading a team of Toronto chocolate lovers in his open concept kitchen. His sweets here are all handcrafted with care, bringing a contemporary twist to traditional European and Stubbe family recipes. Stubbe Chocolates offers truffles, bonbons, almond clusters, orange peels, cakes and celebratory chocolate gift baskets. All of Stubbe’s chocolate gift baskets can be customized by size, theme or flavour preference. Delivery with downtown Toronto is $14. Further afield, GTA locations range between $14-25. Pricing with Canada post varies on the size of the basket but usually starts at $20. Grocery gift baskets by Summerhill Market. Summerhill Market’s Toronto gift baskets are fully customizable, and can contain any variety of their popular prepared foods. 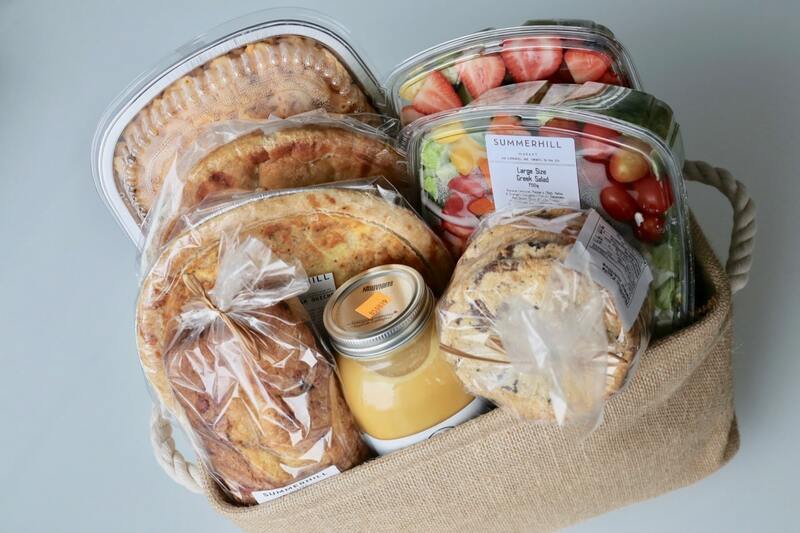 The most popular gift basket at Summerhill Market is the Comfort Food Gift Basket, which contains the grocery stores most popular house-made meals. It’s a great gift basket idea for students during exam season or friends who have recently moved to a new home. The customizable foodie gift basket features soup, salad, cookies, fresh fruit, loaf of bread, quiche, chicken pot pie and mac & cheese. Summerhill Market can deliver anywhere in the GTA within 24 hours. Toronto gift basket delivery is $22 within the downtown core.